As a Clinical Neuropsychologist and Clinical Psychologist, Catherine not only approaches issues through a range of psychological therapies but can also isolate whether the very “function of thinking” itself is involved in the symptoms causing you concern. This is helpful because some neurodegenerative conditions like dementia can present as emotional issues, delaying diagnosis of deeper causes within the brain. Through Attuned, Catherine will gather your personal history and use various well-established, evidence-based, standardised tests to help identify whether problems with actual brain function are at the heart of the matter. Armed with this insight, the Attuned Psychology team can then work with you, and your supporting GP and/or specialist to put in place effective treatment and/or management plans. Her 20 years of providing psychological interventions for adults, children, and the elderly in the public health system, has given Catherine experience to help you face any challenges you might have, be they physical, psychological, disease-based, or due to brain injuries. Catherine’s work as a psychologist has included the rehabilitation geriatrics and palliative care services at Modbury Hospital, Hampstead Rehabilitation Service, Royal Adelaide Hospital. 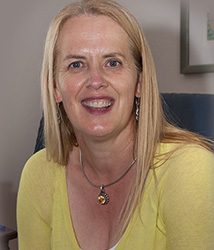 She has extensive experience at the Women’s and Children’s Hospital and Child and Adolescent Mental Health Service, including the Kingsley Fairbridge Child Development Unit and the Australian Craniofacial unit. Catherine has a passion for the decorative arts, design and antiques and building sustainable and nurturing home environments. She combines concepts such as hygge ( the Scandinavian concept of a conscious appreciation of the enjoyment of the present and using simple pleasures such as handicrafts to build a sense of home). This is not only a focus for adults. From her child and developmental psychology background she also applies theories of child development to consider children’s needs for safe, creative and grounded home environments that foster the development of children’s personalities and learning. Catherine bases her therapeutic approach upon a belief that all individuals bring their own strengths and capabilities into stressful life experiences and that evidence based psychological techniques enables people of all ages to plan and implement their own solutions to work through challenges and meet personal goals. Catherine’s therapy embraces wisdom from current scientific theory such as Seligman’s PERMA approach and also approaches and philosophies from many different cultures. However, she recognises it can seem overwhelming at first to implement these approaches let alone sustain healthy behaviour changes long term. Her therapy focuses upon helping clients of all ages find the strategies that fit their personal strengths, developmental stages and their personal goals to successfully to move from unhappiness and overwhelming stress or transition through periods of grief, loss and change. Catherine combines cognitive behaviour therapy with mindfulness and elements of dialectical behaviour therapy. She also draws upon extensive experience in rehabilitation with traumatic injury, brain injury, stroke, cancer and dementia. Her paediatric work has focussed on assisting families and schools in identifying the nature of learning disorders and developmental delay and goal setting to enable children to reach their own particular potential based upon individual strengths.